What is Anxiety, what are the symptoms and can it be overcome? Anxiety is your body’s normal reaction to stress, we all experience it from time to time. Perhaps when we’re preparing for an exam or before a medical test or even a family get together. Your heart begins to race, your temperature changes and you feel agitated or even a little queasy. It’s that feeling of unease, fear or worry. Prolonged anxiety can cause you to feel like you’re going mad or have a psychological imbalance of some sort, but I can assure you that it’s a normal brain function. Anxiety is more an outcome, its a symptom, rather than an illness. You may be able to pinpoint an incident in your life which started your symptoms but you may not and it really doesn’t matter if you can’t. I’d like to help explain Anxiety and how it works, below is a video to help you understand what Anxiety is and why we experience it. The video will help to explain Anxiety symptoms and perhaps even help you understand what Anxiety Treatments or Self Help approaches may work for you. Feeling like you’re having a heart attack, are going to be sick or faint. Feeling like things are speeding up or slowing down. Feeling like you’re going mad or are going to lose control. Feeling like you want to run away or get out of the situation. Feeling detached from the environment or the people around you. Feeling agitated, alert to everything going on around you. "Very good! A very empathetic treatment where you genuinely feel Zoe wants to help you get better. I realise now I don’t need to be stressed all the time, thank you"
The one thing most people who struggle with their levels of anxiety do is avoid any situation which is making them feel anxious. While this gives you short term relief it leads to longer term issues. 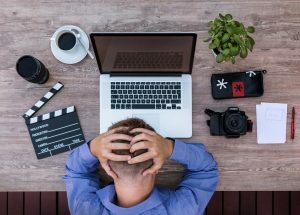 Avoidance reinforces your mind’s belief that there is a danger, the reason behind the system’s fight or flight response, leading to more anxious feelings. It also doesn’t give you an opportunity to see if the outcome of the situation would actually be true adding to the fear of the unknown. 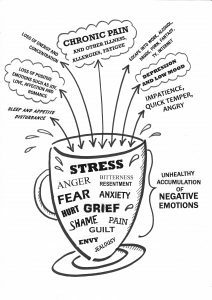 This leads to an unhealthy accumulation of negative emotions just like the overflowing cup image on the right, which leads to the body producing symptoms such as anxiety and TMS (Tension Myositis Syndrome) symptoms, chronic pain and stress. If your feelings of anxiety are making you avoid situations it’s time to get the support you need to address it. The earlier you can do that the quicker you can start experiencing a happy and healthy life again. Zoe is a qualified hypnotherapist, NLP practitioner and TMS/Chronic Pain Recovery Specialist. 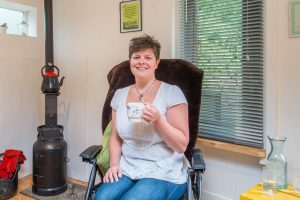 Zoe is passionate about helping people find freedom from the anxiety, stress illnesses such as IBS, Migraines and chronic pain. Zoe specialises in offering a mindbody medicine approach to issues that prevent fulfillment in life and work. Zoe has 10 years experience in helping people and teams make positive change so they feel happier and healthier in their life and work. You can read more about Zoe here. Step 1 – The first step is a complimentary mindset review, this is an opportunity to chat either online or over the phone to learn more about your specific experiences. It’s also a chance to answer any questions you have and to ensure we choose the right Anxiety Treatment approach for you. Step 2 – If we decide my services are right for you we’ll begin with an in-depth assessment, helping you connect the dots and understand what is contributing to your anxiety symptoms. If you would like support with your Anxiety or help in your workplace, click below to book a complimentary mindset review.